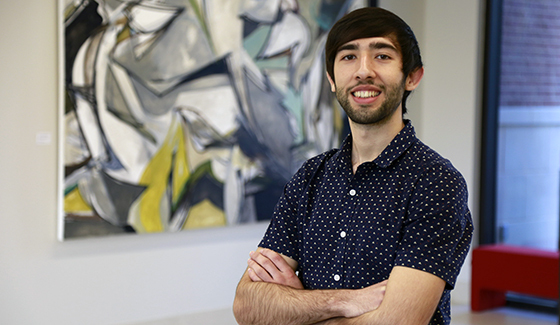 Lamar University art student Gonzalo Alvarez is gaining national attention for his video game art installation, “Borders,” currently on display at the SOL Gallery in the Department of Art. 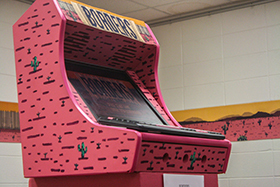 Alvarez created the retro-style arcade game to express both the idea of video games as an art form and to portray the dangers faced by Mexicans who seek to illegally cross the border. A Port Arthur native, Alvarez has recently been interviewed by Telemundo, The Huffington Post, Imagen Television and other national news outlets as his game coincides with the renewed national dialogue regarding immigration. "To actually get noticed to the degree I am right now just feels surreal," said Alvarez. "This is the first video game I ever made - I am an illustrator and had no idea how to make games a year ago - and to have my first shot at something connect with so many people really helps validate my new found career in indie game development. I am passionate about communicating the ideas in the game, and I am glad that more people will be able to experience it and hopefully through the interaction of my design and art choices, they might gain a new perspective and be more sympathetic towards immigrants." 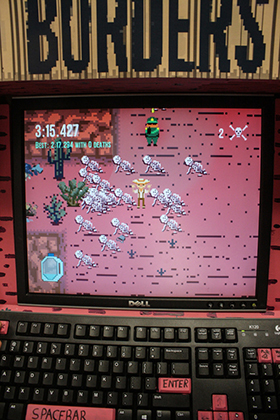 In the game, players attempt to cross the United State's border with Mexico while avoiding "La Migra" (border patrol) and staying hydrated in the unforgiving desert terrain. The place where every player dies is permanently recorded into the video game’s world, represented by a skeleton. According to Alvarez, this symbol communicates where players should be careful and represents the large death toll claimed by Mexico’s deserts - roughly 1,000 lives a year. Alvarez is the proud son of Mexican immigrants, now U.S. citizens, who crossed the Southern border to seek a better life in America. He is the first of his family to attend college. At LU, Alvarez applied and was accepted in the McNair Scholar's program in order to fund his video game research. 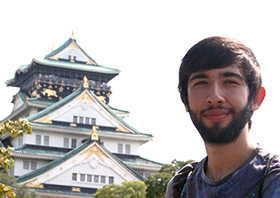 He also designed an independent study abroad experience to explore drawing and video game design in Japan with Christopher Troutman, assistant professor of drawing in the Department of Art. Based in the prefecture of Miyazaki, Alvarez worked on his art and his Japanese and traveled with Troutman to Beppu, sister city to Beaumont, where they met with students and faculty of Beppu University and hung an exhibition of LU student artwork. He also visited the towns of Yufuin and Miyakonojyou and toured the gardens and museums of Kagoshima City, as well as the local hot springs and Mount Tsurumi. While in Japan, Alvarez traveled to Tokyo and met with two of his biggest influences, Hidetaka Miyazaki, CEO and creative director of FromSoftware; and Kentaro Miura, the creator of the manga “Berserk.” Both shared their creative processes. "I often tell Gonzalo in working with him on his many projects to hope for the best and expect the worst - we just have to see what happens. Yet, he's succeeded at every turning point," said Troutman. "He is remarkably driven to pursue his dreams and builds the skill sets required as the need arises. Those skill sets spread out to the people around him. I've never had a student like him nor have known a student like him when I was in school myself. He makes everyone around him better." Alvarez is expected to complete his Bachelor of Fine Arts in Studio Art with a concentration in drawing in December 2017. After graduation, he plans to continue his studies in graduate school, with the ultimate goal of becoming a creative director at a video game studio. “I want to make the next generation of video games, comics, and cartoons, which was the culture that influenced me so much growing up in Port Arthur,” Alvarez said. He continues to draw inspiration from his Mexican heritage for his next project and future thesis, a Mexican fantasy comic titled "The Legend of Polloman." "Stories about creatures or ghosts such as 'La Llorona' and 'El Cucuy' were told to my generation of kids to scare them away from doing bad things or staying out late and there wasn't a single Hispanic family member or friend who didn't know about them," Alvarez said. "They were real for all we knew. My comic revolves around retelling these stories in a fantasy setting full of whimsical creatures and characters to not only entertain, but educate the next generation of kids about the interesting culture of Mexico." "Borders" will be on display in the SOL Gallery until March 26, 2017. It may also be downloaded at https://gonzzink.com/portfolio/borders/. For more information on this and Alvarez's future projects, visit www.Gonzzink.com or follow @Gonzzink on social media. For more information on the Department of Art at Lamar University, visit www.lamar.edu/art.